Phoenix, AZ - Daystar is pleased to offer their newest combo kit for the Jeep JK Wrangler, KJ09143BK. 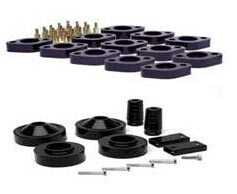 This new part number combines Daystar's 1" body mount kit with their 1 3/4" lift kit. The combo kit provides room for up to 35" tall tires while maintaing factory ride quality. - 1 inch Urethane body mounts easily install between the factory body mounts and frame, keeping the body accurately centered on the frame. - Top-loading coil spacer, no disassembly of the stock coil required.